Richland County, SC — A video was uploaded to Instagram on Monday which shows a jaw-dropping assault on a female high school student by a cop. 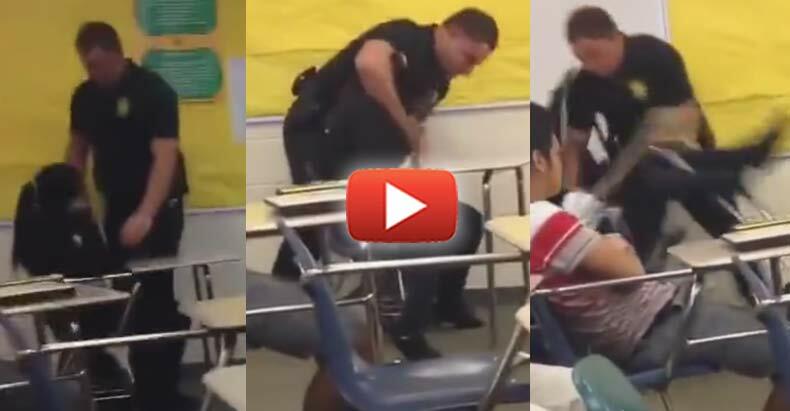 Parents are outraged after watching a school resource officer, reportedly Ben Fields, of Spring Valley High School, violently attack a peaceful young girl. The video began spreading on social media sites Monday afternoon. In the video, a female student is seen being 100% non-violent when the officer approaches her. When the officer grabs her, the girl does not respond. The officer then puts her in a headlock, and then he flips her backwards, throws her on the ground, and drags her several feet like an animal. "The Richland County Sheriff’s Department is the agency that has school resource officers at Spring Valley High. Richland County Sheriff Leon Lott tells News19 that a disruptive student refused to leave after a teacher asked her to. An administrator was called to the room, and also asked the student to leave, Lott said, and she refused again. Finally, the school resource officer came to the room. Lott said the officer forcibly removed the student and she resisted arrest. Lott said the child was put under arrest." At no time did the Sheriff’s department ever claim that the student became aggressive, violent, combative, or anything else that would justify this officer’s abuse. The Richland School District released the following statement Monday afternoon after the video began to go viral. The officer’s actions are entirely uncalled for and criminal. Since when is it okay to violently attack a non-violent student? Please share this story so that we can let other officers know that their aggressive violence will not be tolerated.